How is the drawing process suite used? The drawing process suite allows running several processes in one shot to automatically get workshop drawings in a quick way. The drawing process suite can be customized by opening the "Drawing process suite" manager. In the "Drawing process suite" manager, go to the User branch for customization. Using the icons on the top-left of the dialog box, you can rename the existing (process) suite, copy it or create a new one. 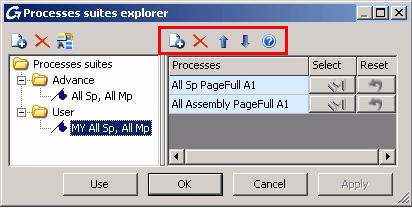 Once a process suite is selected, using the icons on the top-right of the dialog box, you can insert a new process, delete a process or change the order of processes. Then for each process, you need to select the objects from your model for this process; this can be done by clicking the blue button (called "Select objects for process") in the dialog box and then graphically selecting the elements in your 3D model and then pressing Enter. You will notice that once your selection is done, the blue icon has a bit of yellow. Note: If you made a mistake in your selection, you can reset your selection by clicking the red button (called "Reset selection") in the dialog box. To start the drawing creation, click the "Use" button and your process will run in the defined order, and the workshop drawings will be automatically created.